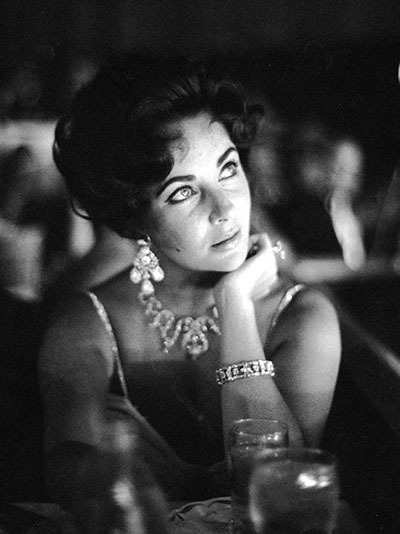 “Life without earrings is empty!” Elizabeth Taylor once proclaimed. One of her favorite pairs were diamond and platinum chandeliers. She was photographed in these earrings more frequently than any other jewel in her collection. Don’t get me wrong, I’m not saying she wore the jewels more than any other. 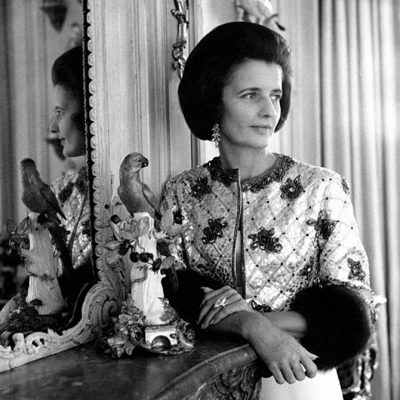 The piece she put on every day for years was the 33.19-carat Krupp diamond ring, a 1968 gift from Richard Burton. Taylor was photographed a few times magnificently showing off the Krupp, but more often than not the piece was a little challenging to see on her hand. The earrings, however, appeared front and center in countless pictures throughout her life, particularly around the period when she received them from Mike Todd. 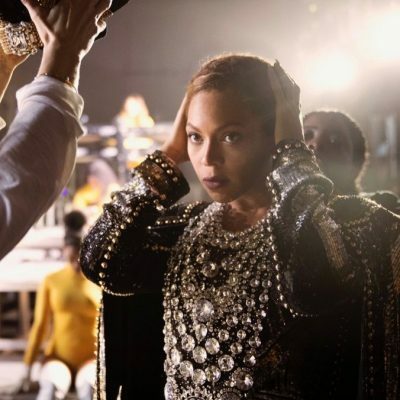 While the jewels may not be her most important or expensive treasure, arguably all the times she was photographed wearing them magically transformed the sparklers into one of the most glamorous jewels in her collection. The second part of the story is when things become really romantic. One day in 1957 when the couple was in New York, Taylor was getting dressed for an evening out. Once she put on the jewels, she thought they felt different. In her biography she recalled telling Todd, “Mike, there’s something wrong with my earrings. They’re not quite the same.” At that moment, he revealed he had her beloved costume jewels transformed into the real thing. While the story almost seems like a fairy tale, it was perfectly in keeping with the inventive ways Todd enjoyed giving Taylor jewelry. His professional reputation for being a showman carried right over into his flair with jewelry presents. 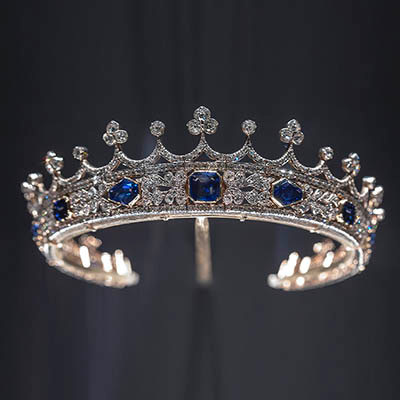 For example, he gave her an antique tiara shortly before the 1957 Oscars to wear at the event when his film Around the World in 80 Days was nominated for and won the Best Picture prize. When Taylor was pregnant with the couple’s child Liza and vacationing at villa La Fiorentina outside of Monte Carlo, he gave her a Cartier ruby, diamond and platinum necklace and earrings poolside. The actress, who also knew a thing or three about showmanship, proceeded to finish her swim in the jewelry while being filmed by a friend. 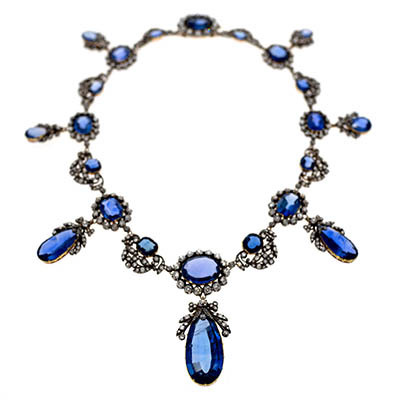 A Belle Epoque diamond necklace was another surprise gift from Todd that she often wore with the chandelier diamond earrings. While Todd clearly knew his way to Cartier, his resource for the vintage jewelry has remained under wraps. Whoever it was they could possibly be the same jeweler who recreated the diamond chandelier earrings. No one has ever come forward and claimed the magnificent work. 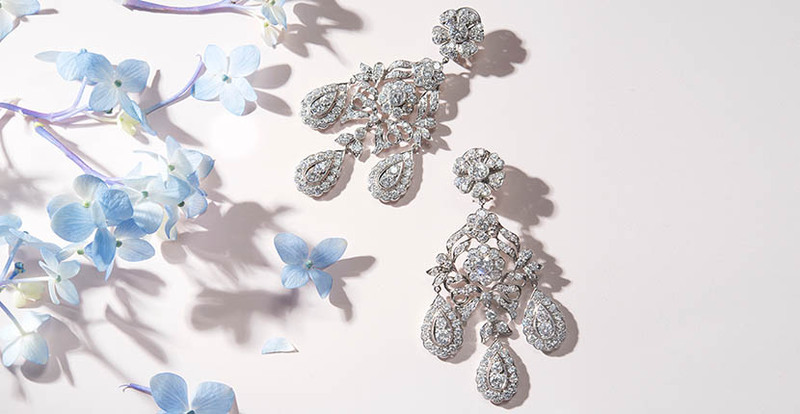 The design references eighteenth century style girandole diamond earrings with three pear shape drops accented by ribbons and flowers. A major difference between the historic styles and Taylor’s earrings is the platinum setting. In the distant past the piece would have been created in silver topped gold, a combination that did not have the refined quality of platinum. It wasn’t until around 1900 that technological advances gave jewelers the ability to work platinum into the elegant natural curves of ribbons and flowers. By the mid twentieth century, when Todd had Taylor’s earrings made, platinum was the metal used almost exclusively for formal jewels. 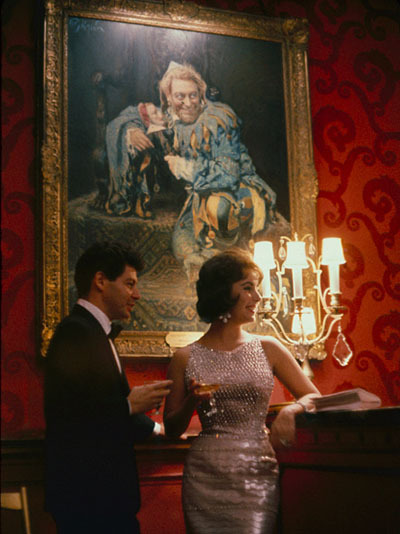 The storybook romance of the Hollywood couple came to a tragic end on March 22, 1958, when Todd’s private plane crashed on a flight he was taking to New York to accept the Friar’s Club award for Showman of the Year. 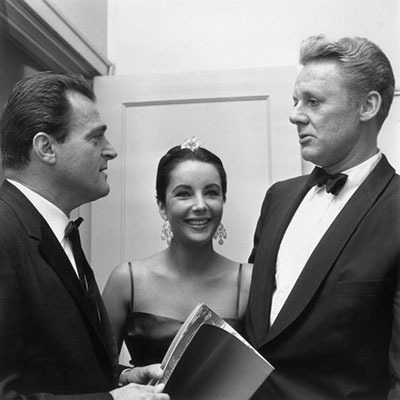 When Taylor received the news she was two weeks into the shooting schedule of Cat on a Hot Tin Roof (1958). The star showed her famous inner strength and not only finished the film, fueled by her grief, she delivered an Academy Award-nominated performance for the heart wrenching drama. In the period following Todd’s death, Taylor turned to his best friend singer Eddie Fisher for solace. Their subsequent marriage grew out of a mutual affection for Todd. Taylor showed her mettle, yet again, bravely continuing her career and not shying away from the public, despite the venom heaped on her by the members of the press who championed Fisher’s ex-wife Debbie Reynolds. During this time Taylor, who was truly at the peak of her beauty, kept Todd’s memory tangibly near her by perpetually wearing the diamond chandelier earrings. She had them on for a few of Fisher’s Las Vegas performances at the Hotel Tropicana. 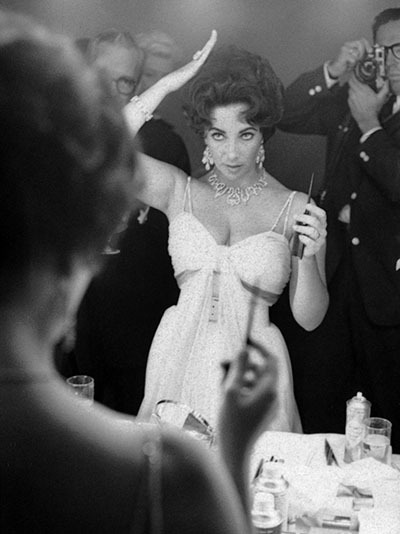 She wore them to the 1959 Los Angeles premiere of Suddenly Last Summer and a performance at the Metropolitan Opera in New York. 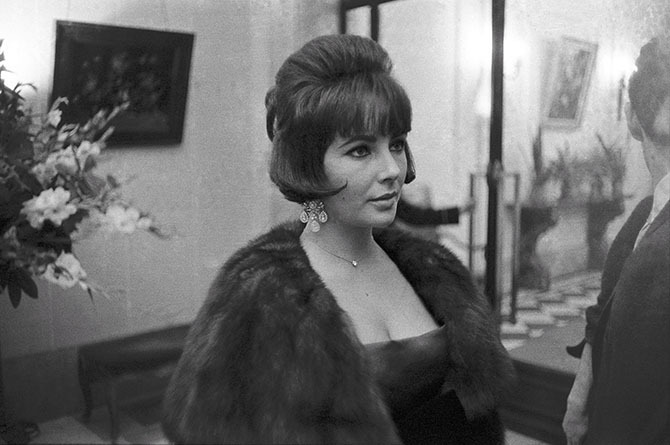 She was also photographed wearing them at the Hotel Lancaster in Paris during a stopover before shooting Cleopatra in Rome. *Special thanks to Talya Cousins for the lyrical art direction of the lead image in this story and Dylan Griffin for the beautiful photograph.